COLORADO SPRINGS — If NASA’s human spaceflight program is redirected back to the Moon, Blue Origin is ready to support it with its proposed “Blue Moon” lunar lander system, company president Robert Meyerson said April 5. Blue Origin would be willing to invest in development of the Blue Moon system as part of a partnership with NASA, Meyerson said, envisioning regular delivery of resources and supplies to a potential lunar colony to augment NASA missions launched by the agency’s own Space Launch System. NASA’s current human spaceflight plans do not include human missions to the lunar surface. Instead, NASA has outlined an an architecture that calls for the development of a human-tended facility in cislunar space, called the Deep Space Gateway, by the mid-2020s intended to support testing of technologies needed for human missions to Mars in the 2030s. However, other nations have expressed interest in human missions to the moon, and the Deep Space Gateway could support such missions. 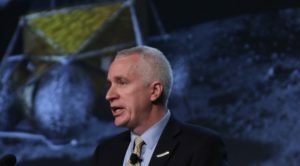 “The goal is to see what we can prove out in the area around the moon and work with our international partners to see what we can do on the surface of the moon,” NASA Acting Administrator Robert Lightfoot said of NASA’s plans here April 4, adding that such cooperation would be extended to commercial partners as well. The proposed Blue Moon design would be optimized to fly on SLS, but could also launch aboard other rockets including United Launch Alliance’s Atlas 5 and Blue Origin’s own New Glenn rocket, he said. Lunar missions fit into the vision of company founder Jeff Bezos, who frequently talks about a future with an extensive human presence beyond Earth. “The lunar surface offers valuable resources with valuable science return and can serve as a location to demonstrate key technologies and serve as an appropriate location for that long-term permanent settlement,” Meyerson said. Jeff Foust contributed to this story.